This Holmsbu pram is a working descendent from the same ancestor as many small yachts and dinghies in Britain today. This particular craft was used for herring fishing in the Oslo fjords of Norway. 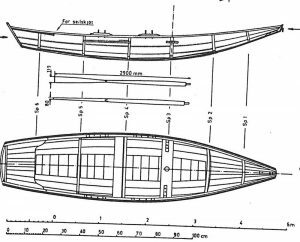 The aft part of the boat is closed off with a bulkhead and planked over to form a watertight compartment in which to store gear. The after thwart, unlike the forward one, is not fixed but can be slid along a short run of side frames. This form of hull known more commonly as prams were exported from Holmsbu to Denmark and the Netherlands with their influence reflected in the larger pram yachts seen in Friesland today. She can be sailed and is complete with a single mast rigged with a sprit sail or lug.